After losing 42-30 to Central Plains in the Class Eight-Man, Division I state championship game last fall, it seemed as if the Hanover Wildcats would have to rebuild. Hanover graduated all but two defensive starters and 87 percent of its total offensive production in terms of yards from that team. Nearly a year later, Matt Heuer’s Wildcats are undefeated and one win away from returning to Newton to play for another title. Hanover will travel to No. 3 Burlingame (11-0) in Friday’s state semifinal showdown. Hanover has reinvented its offense to a pass-first attack. In 2014’s state runner-up season, the Wildcats produced 55 percent of the team’s total offensive production on the ground and 45 percent passing. The Wildcats passed on 30 percent of all offensive snaps in 2014. This season, Hanover passing yards account for 75 percent of its total offense and nearly 59 percent of all offensive plays are passes. The result of adapting this approach has been a record-setting season from junior quarterback Will Bruna. Bruna (6-1, 170) has completed 77 percent of his passes for 3,010 yards and 51 touchdowns this season. He threw for 373 yards and four touchdowns in Saturday’s 68-46 win over West Elk. That performance helped him surpass the Kansas state record of 2,837 passing yards in a single season set by White City’s Michael Hammersmith in 2000. Bruna’s 51 touchdown passes this season are one short of the state mark of 52 set by Central Burden’s Bo Savage in 2010. He’ll likely break that record this week as the Wildcats take on Burlingame in the state semifinals. Four different players have more than 500 receiving yards for Hanover. Senior Trey Lohse has a team-high 54 receptions for 1,000 yards and 21 touchdowns. Lohse’s classmates Matthew White and Devin Jueneman have 647 and 610 receiving yards, respectively. Jueneman has 10 touchdown catches, while White has nine. 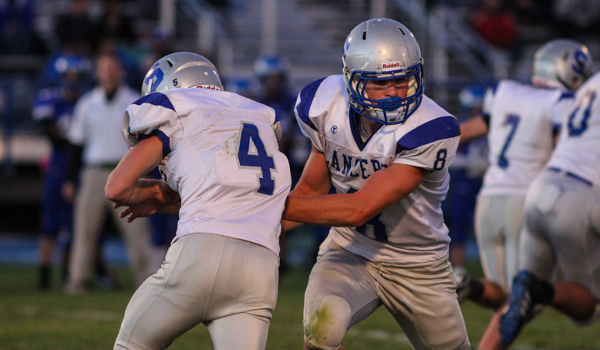 Junior Adam Zarybnicky is second on the team in receptions with 45, and has 583 yards and nine touchdowns. Zarybnicky leads the defense with 114 stops. Opponents are scoring just 14.7 points per game against the Wildcats. Burlingame is in the playoffs for the first time since 2004 and has reached the state semifinals for the first time since winning a Class A championship in 1972. The Bearcats captured the state title that year while never scoring more than six points in any of those three playoff wins. Burlingame beat Madison 6-0, Clifton-Clyde 3-0 in overtime, and Protection 6-0 in the championship game. The 2015 Bearcats are a bit more prolific on the scoreboard. Burlingame averages 55.1 points per game while allowing opponents to score just 17.8. Last Saturday, Burlingame used a 32-point second quarter to outscore Central Burden 74-54. The Raiders would pull within 40-32 in the third quarter before Burlingame scored the next 20 points to put the game away. Robert Hutchins rushed for 149 yards and six touchdowns to lead the Bearcats. Hutchins has 1,376 rushing yards and 28 touchdowns this season. Sophomore quarterback Dalton Sporing has passed for 1,599 yards and 29 touchdowns while only throwing three interceptions. Sporing has also added 579 rushing yards and 13 scores. The Bearcats are led in receiving by seniors Harrison Summers, Clay Thomas, and Tanner Tyson. Summers has 35 catches for 692 yards, both team highs. Thomas has caught 31 balls for 449 yards, while Tyson has 19 receptions for 316 yards. Tyson leads the team with 11 touchdown catches, while Summers and Thomas each have eight. Senior Paul Holt (6-2, 185) is one of the classification’s best and leads the Bearcat defense. Holt has 134 tackles including 15 tackles for loss and 16.5 sacks. He’ll need to pressure Bruna for the Bearcats to advance. Spearville earned a huge home victory, 58-28, versus defending champion Central Plains last Saturday. The Lancers had lost 42-40 at Central Plains last season, and the Oilers went on to win the state title. Spearville has outscored opponents 590-88 and ranks No. 1 in the classification in scoring defense. Solomon has made a six-win improvement under first-year coach Steve Tiernan, formerly at Baileyville B&B and Osborne. The Gorillas’ lone loss came in Week 8 to Central Plains at home, 46-14. Solomon has a total score of 510-176 with the No. 2 SOS in the classification. Spearville has the No. 16 SOS with a 64-14 win against Atwood-Rawlins County in the first round and the victory against Central Plains last week. Solomon defeated South Central, 46-44, in the first round and beat St. Francis, 34-26, last Saturday. Spearville had beaten South Central, 52-6, in Week 2. Solomon has matched the 2012 team for farthest advancement in school annals. Spearville is in the sub-state game for the fourth time in school history, with the last appearances in ’96 and ’97. Like the Gorillas, the Lancers have never made a state football game. The game features two of eight-man’s best quarterbacks in Spearville’s Nathan Stein and Solomon’s Jake Tiernan. Prep Power Index lists Spearville as a 16-point favorite. Solomon has enjoyed a great season, but Spearville has dominated the western half of the classification this fall.